Be the first to share your favorite memory, photo or story of Isaiah. This memorial page is dedicated for family, friends and future generations to celebrate the life of their loved one. Isaiah “Dale” Ike” Duke, 65, of Cloverport passed away suddenly Sunday, September 30, 2018 at Owensboro Health Regional Hospital. “Dale” was born November 25, 1952 in Breckinridge County to the late Curley and Janie May Smith Duke. He loved farming and tinkering with things and staying with a project until he figured out how to repair the item. Besides his parents he was preceded in death by his wife, Nancy Hall Duke; 5 brothers, Heybert, Frank, Eugene, Maurice, Jr. and Jimmy Duke and 2 sisters, Geneva Phillips and Jean Brink. 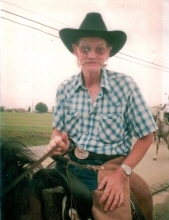 Leaving behind to mourn his sudden passing is his long-time companion, fiancée and best friend, Patricia Martin of Owensboro; daughters, Carol (Ronald) Smith, of Cloverport, Kelly (Mark) Noblett, Webster, April (Jim) Lish of Billings, MT; sisters, Maxine Fuqua, Hardinsburg, Margaret Taylor, Lewisport, Melvina Ziakes Duke, Louisville, Deloris Ray, Cloverport, 13 grandchildren, 8 great grandchildren and several nieces and nephews. A celebration of “Ike’s” life will be held, 2:00 pm, Thursday, October 4 at Cloverport Funeral Chapel with Sister Janet Flood officiating. Burial will follow at Taul Cemetery in Breckinridge County. The family will receive friends and family Wednesday, October 3 from 4:00 – 8:00 pm and Thursday, from 8:00 am until service time. You may share your thoughts and memories of “Dale” with the family on our website: www.cloverportfh.com. To plant a tree in memory of Isaiah 'Dale' 'Ike' Duke, please visit our Tribute Store. "Email Address" would like to share the life celebration of Isaiah 'Dale' 'Ike' Duke. Click on the "link" to go to share a favorite memory or leave a condolence message for the family.